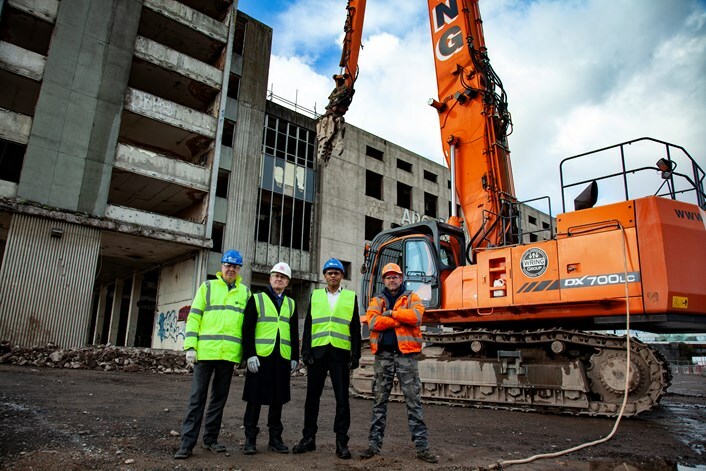 Demolition of the former Royal Mail sorting office next to Bristol Temple Meads station started this week – ridding the city of a notorious eyesore and triggering a key milestone in the regeneration of the Temple Quarter district. The building, which has stood vacant since the Royal Mail moved its operation to Filton in 22 years ago, has become a symbol of the lack of action by successive administrations and public bodies for two decades on a prime development site. Over that time it has also become a haven for squatters and graffiti artists as well as a venue for illegal raves. Its demolition – which will take up to six months – will pave the way for the University of Bristol to develop its Temple Quarter Enterprise Campus, helping transform the wider Temple Quarter area into a new part of the city. Bristol City Council bought the site in 2015 and, after securing an agreement for its sale to the university in 2017, brought in contractor Kier to strip out the building and prepare it for removal using heavy machinery. Mayor of Bristol Marvin Rees started that process by giving a signal to the demolition workers. He said: “This is a really exciting day for Bristol and the Temple Quarter. This eyesore building has been a blight on the landscape for too long – its demolition will be the start of a new chapter for the area. “As well as creating a brand-new university campus, the clearance of this site will unlock new routes to the station and open up vital links between the east of Bristol and the centre. “I’m proud that this has been brought about by decisive action on the part of the council and through close working with our partners – it shows what we can achieve when we work together. The university plans to create what it is calling an “open and welcoming campus” on the seven-acre site, which spans the sorting office plot and part of neighbouring Temple Island, once the planned site of Bristol’s long-delayed Arena. It will provide teaching, research and innovation space for 800 staff and 3,000 students, with accommodation on site for up to 1,500 undergraduates and postgraduates, with public spaces on the campus including a new waterfront, cafes and shops along with new walking and cycling routes. The university says the campus, which is expected to open in 2022, will be at the forefront of digital and management research, education, skills and innovation.